In some European countries, newspaper articles written before the death of some important figure, are called “crocodiles”, lumping together those lamenting or rejoicing at that death, whenever it may occur. And as we know, the European historical left has disappeared, replaced by an assembly of sycophants, buttock-lickers of transatlantic masters, muddled applauders of neo-liberal philosophy and regurgitators of grotesque distortions. In one of which distortions, for example, the inimical, colonial role of the US towards Cuba is not even mentioned. Instead, Castro is labeled as a doctrinarian, bent on absolute dictatorship, who became a Marxist and eliminated all his opponents. Even clashing with the ideas of Che Guevara who was forced to try his luck at a revolution somewhere else. Therefore, the European “crocodiles” reflect the crass negation of factual reality, or rather an Orwellian reality inspired by the tenets of post-democracy, post-truth, post-mathematics and even post-statistics, as the recent, uniform and unanimous Clinton-the-winner polls by mainstream media and academia demonstrate. Yet, by an unexpected turn of history, the Cuban revolution has meanings as relevant today as in the late 1950s. For the revolution aimed both at social reforms and national independence. Nor the reforms could have been possible without independence. For the presence of “the few who had all” and “the all who had nought” was inherently linked to the neo-colonial (today re-baptized neo-liberal) policy of the effective, de-facto imperial ruler, 90 miles away. Just as today, allowing for a change in times and circumstances, we can consider the so-called “European Union” as a kind of pre-Castro territory ruled by the United States, via its perennial proxies, much as Latin America had always been, barring recent exceptions. Meaning that there can be no reforms without returning to national independence. The US elites assumed that Castro’s revolution would result in a minimal restructure of the Cuban administration, leaving untouched the massive inequalities, the immense private land-holdings, the state of servitude and the bordello-economy (even portrayed by Hollywood). In other words, an orange-revolution to strengthen a banana republic – a structure held together by American interests, and by the military, when necessary, as in all other Latin American countries. But “in the reproof of chance lies the true proof of men.” (2) Incredulous, bewildered and amazed with wonder at the turn of Cuban events, the US leadership developed the thesis that the Cuban revolution would die if they killed Fidel. And following his death, the hated socialism would collapse like a house of cards. As a keen commentator noted, the thesis was also a way to exorcize the unthinkable idea that a socially-inspired government could exist at a short distance from the imperial coast, and in the conditions created and imposed by the embargo. The US elite could not accept, let alone explain the popular consensus of the Cuban people for and towards Fidel Castro. Who can forget the images of Revolution Square in Havana, filled to the brim by people intently listening to Fidel’s extended, eloquent and at times even amusing oratory? Unable to create an ISIS before its times, the US engaged into a series of assassination attempts, that would even be laughable, were it not for the many people who died in the process. Or so they thought, when they staged the Bay of Pigs invasion, supposedly attempted by “revolutionaries” in the payroll of the CIA. Invasion that also showed, after the fact, the lengths to which the parties responsible for the fiasco went, to cover their asses. Nor we should forget Operation Northwood, intended to sink an American ship, kill American citizens on the mainland, and accuse Castro of the crimes. As we know, Kennedy rejected the program and it may have contributed to his assassination. Which, by extension, should also tell us some something about who did 9/11 and about the elephant in the room, that apparently no one in charge can see. Much has been made by the Western media and governments that Castro stifled dissent. I remember clearly the words of Castro on the subject. We do not mind – he said – do not condemn or regret people who complain about this or that aspect of the government, because it is their government after all. But we cannot accept those people who are paid and financed by our enemies to work against our government. After the experience of Ukraine (“We spent 5 billion $ to turn Ukraine into a “democracy” – said Victoria, f…k-the-Europeans, Nuland), who could still criticize Castro for his position on the issue? He was accused of being a communist and a Russian ally. He actually wasn’t until the empire tried the Bay of Pigs invasion. The missile crisis, as we know, was both a result of the Bay of Pigs attempted invasion and of the US installation in Turkey of nuclear missiles aimed at the USSR. Against Castro the US cabal tried it all and all was unsuccessfull. Eventually, they hoped that the fall of the USSR would lead to the fall of Cuba. They even had Pope Woytila visiting Havana, hoping that he would create there another Poland. Instead, he almost obtained the opposite effect. Contrary to relentless propaganda, Castro did not repress religion. But, as he expressed publicly to the Pope, the Catholic hierarchy, notably at the onset of the revolution sided with the oppressors, with the bordello keepers and the casino holders. Opposition to certain religious leaders does not mean opposition to religion, said Castro. Woytila was forced to declare, however platonically, against the embargo. Still unable to explain the success of the Cuban revolution, some mainstream media pundits have now produced another theory. It was the very embargo that kept alive the Cuban regime. While in Europe, a massively parasitic European parliament wants to censure (read ‘block’) politically unpalatable Internet channels. Perhaps it has not yet sunk into the minds of these people that the official media is but a sewer of lies and deception. And that for one censored site, uncounted more are ready to take over. … the spirit that now is heard at large through the miracle of expanded electronic communications. I will close by citing verbatim the homage to Fidel by George Galloway. “Fidel Castro did not die. He is not dead, he lives-on in all of us and in the lives of our children, even though as yet unborn. And that is why these gold-tooth, scar faces are dancing in Miami today, because they think that they will be going be back to business as it was before. The greatest legacy of Fidel Castro is that Cuba will never ever again be anybody’s casino, anybody’s bordello. 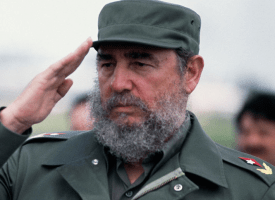 It is a free country, thanks to the Cuban revolution and its leader Fidel Castro, one of the greatest human beings who ever lived, who ever walked this earth. We were privileged to live in his era. Some of us were privileged to be his comrade and friend and to spend many hours with him. In the play (opening quote). Hamlet’s comment on his father, slain by Hamlet’s uncle Claudius.